Now any Doctor Who fan can own their own 13th Doctor Who Figurine. The figurine made by Funko in their Rock Candy series and the Doctor comes in a cool box so that you can keep it in new shape if you like. The figurine of the Doctor looks just like the real 13th Doctor with her blond hair and long coat. At about 5 inches tall the figurine is just the perfect size for on a shelf in your home or maybe the office. The 13th Doctor Who is the first female doctor and that makes it an extra reason why you really want this figure. Now you can now your own 13th Doctor Who Barbie Doll. 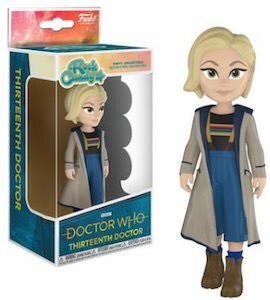 If you like Barbie and Doctor Who then you are in luck because with the first female doctor Mattel decided to make us a Doctor Who Barbie based on the 13th Doctor. The Doctor Who Barbie looks just like the real female Doctor wearing her famous outfit and holding her Sonic Screwdriver and like a true Barbie she has the perfect hair too. 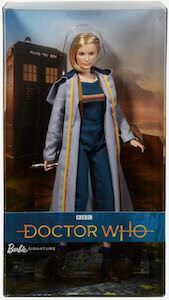 The Doctor Who doll is 11.5 inches tall and is great to play with as she is a true action figure too and maybe she like to hang out with Ken. 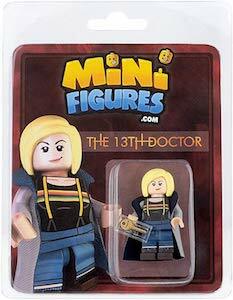 Anyone that likes LEGO figures and Doctor Who should check out this 13th Doctor LEGO minifigure. The figurine of the first female Doctor Who is the typical LEGO figure only this time it is made to look like a true Doctor Who so she is wearing her coat and even carries the key to the Tardis. Sure this is not an figurine build by LEGO but it is made from new LEGO parts and with added custom parts. And the Doctor Who minifigure comes in a nice package which makes it a fun present for a true Doctor Who fan that loves LEGO too. 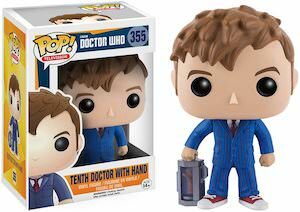 If you are a true Doctor Who collector then you should be checking this 10th Doctor and a hand figurine. The figurine of the 10th Doctor is part of the Funko pop! series and this time Doctor Who is wearing a nice blue suit and his red sneakers and as two hands are often not enough he is bringing a 3e one in a canister. And like all the Pop! figurines this Doctor Who figurine come in the typical box with the window so that you could choose to keep Doctor Who in new state while still being able to admire him and have all your figures nicely stacked as the boxes are about the same size. 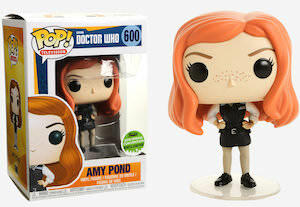 Now there is an Amy Pond Pop! figurine and it is a limited edition so you have to be quick. The figurine on Amy is party of the Pop! series that we all know and that also means that she will have the big head and yes it has red hair and she is wearing the police uniform she wore in the first episode she was in. Amy is number 600 in the Pop Vinyl series and it is a 2018 spring convention exclusive and to me that means that after the spring it will be over so make sure you add her to your Doctor Who collection. If you like the 9th Doctor Who then you should be check out this 9th Doctor Who figurine. 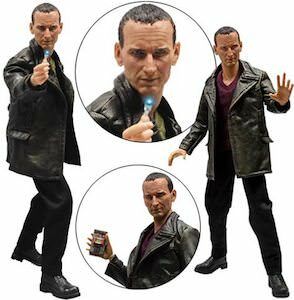 The Doctor Who action figure is the 9th Doctor in all the details you expect from his hair an leather jacket all the way to the banana and the Sonic Screwdriver. The 9th Doctor figure has 8 replaceable hands that can hold lots of the included items that include banana, Sonic Screwdriver, wallet, and much more. And the Doctor comes with its own base so that it will look amazing standing on a shelf in your home and I am sure that other Doctor Who fans are going to be impressed by this cool figure. Now you can build your own Cyberman and that could be cool for all Doctor Who fans. 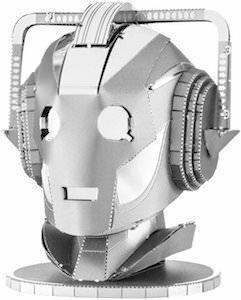 This Cyberman model kit will make it possible to build you own Cyberman bust. Included in the kit is the metal and the instructions but you may need some tools to connect the pieces. You can spend hours just thinking about deleting things because you will be building your own Cyberman to be part of your Cybermen army. So just build your own Doctor Who figure and display it as part of your Doctor Who collection. Now you can have a Playmobil action figure that looks like the 4th Doctor Who and that makes it highly collectible and cool. 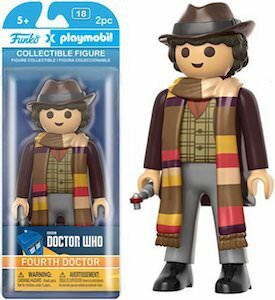 The figurine looks just like the typical Playmobil figures we all played with when we were young and now you and the kids can play with this Doctor Who Playmobil figure. The Doctor Who action figure is 6 inches tall and that makes him bigger than normal Playmobil characters and he does look like the 4th Doctor complete with scarf, hood, and Sonic Screwdriver. The Doctor Who figure is rated ages 5+ so you can play with it like a toy or have it as a display piece that is part of you Doctor Who collection. 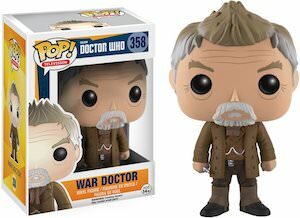 This War Doctor Pop! figurine is what every Doctor Who fan needs in its collection. And the War Doctor that we saw in the 50th-anniversary episode is just like on TV wearing the same outfit and facial hair. The Pop! figurine is number 358 in the Funko series and is 3 3/4 inches tall and comes in an amazing box. If you collect Pop! figurines then this special Doctor Who one is a must have and I am sure that he will blend right in with all the other Doctor Who and other figurines you own. If you like the rocking version of Doctor Who then you need to get yourself this 12th Doctor figurine. 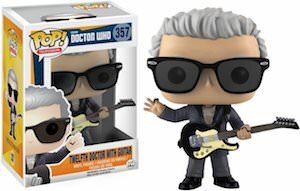 The figurine shows the Doctor complete with Sonic sunglasses and his guitar and he is ready to rock the dancefloor. The Doctor Who figurine is number 357 in the Pop! vinyl series from Funko. At 3 3/4 inches tall the Doctor is the same size as most Pop! figurines and that makes him fit perfectly in your collection. And just like the rest this 12th Doctor figurine also comes in an amazing box that has a plastic window on the front so that you can look at him without unpacking the Doctor and that way he stays new.